Bolivia has been critically affected by climate change in recent years, with highlands experiencing severe flooding and lowlands experiencing drought. These disruptions have resulted in poor agricultural yields that are particularly concerning considering the reliance on agriculture for subsistence and the precarious nature of the postcolonial economy. In response to these impactful changes and the history of neoliberal structural adjustment beginning in the 1980s, a movement has formed based around anti-capitalist and ‘living well’ (Andean indigenous ideology) sentiments to address climate change in Bolivia and around the world. 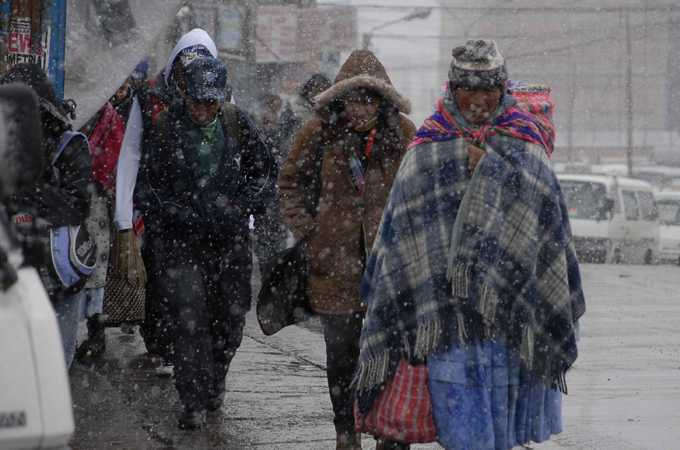 Bolivia is currently facing serious threats regarding climate change. These threats include the melting of Bolivia’s glaciers, the spread and return of illnesses, rural-to-urban migration, deforestation, and agricultural failure. Such impacts are increasing in magnitude and Bolivia is particularly vulnerable, as it is a resource poor and non-industrialized nation. Meanwhile, Bolivia, like much of the global south, has contributed negligibly to climate change. In response, a movement of resistance has emerged. In the 1980s, Bolivia was subjected to neoliberal structural adjustment because of the nation’s debt and the International Monetary Fund. Such neoliberal structural adjustment can be briefly characterized by reduced government spending, the privatization of natural resources, dollarization, the elimination of protectionism, and reduced power of the state over transnational corporations. Neoliberalization was furthered by additional neoliberal reforms of the 1990s by Bolivian President Gonzalo Sanchez de Lozada, followed by the attempted privatization of water in 2000. These measures, coupled with the majority indigenous and rural-based population within the postcolonial context, led to strong, organized resistance from several forces of society. The movement emerging out of these neoliberal reforms originated as an alliance between mainly rural indigenous communities and urban, middle class leftist communities. However, it is now characterized more so as connecting national and international NGOs with grassroots rural and indigenous organizing. Furthermore, with the election of Evo Morales in 2005 (an at least rhetorically anti-capitalist president), Morales and his administration became members of this alliance, albeit conditional. The Morales administration has both championed anti-neoliberal, environmentalist, and anti-privatization policies and rhetoric, while also continuing some unsustainable development projects, which have neglected indigenous communities. This dialectic characterizes a major contradiction of the Morales’ administration; playing both the role of supporter and coworker of the movement, while also the role of opposition in certain cases. Furthermore, this administration has had an overarching approach of using the extraction of natural resources such as oil for redistributive programming. This has experienced strong success, such as the cutting of poverty by 20% in 6 years, but also demonstrates an ironic duality of the administration’s approach to climate justice. Despite the conflicting nature of this administration regarding the emerging movement, Morales and his administration have worked with and been responsive to grassroots organizers in Bolivia. Moreover, this administration has been a remarkably strong advocate of the movement’s message and values in the international arena. Specifically, Morales has advocated for the ‘living well’ ideology internationally, and the connection between capitalism, colonialism, and climate change. Further, Morales has been a staunch proponent of the idea that the Global North must take serious responsibility regarding both emissions cuts and assistance to global south countries in becoming more sustainable. The seriousness of the Morales administration internationally (with respect to climate change) is largely due to the strength of the grassroots movement developing over the past 30 years. Because of the alliances and organizational success of this grassroots movement, this movement has been a strong contributor to the building of a radical international movement confronting climate change. This can be seen in the involvement of this movement with the historic New York climate justice march of of 2014. Overall, this movement can serve as a model for organizing against both neoliberalism and for progressive climate change policy. Something particularly relevant in the United States, considering our destructive impact on the environment, and our lack of political accountability surrounding climate change. This entry was posted in Alexander Brown, Policy and tagged Climate change, Imperialism, Kathryn Hicks, Latin American Perspectives, Neoliberalism, Nicole Fabricant, Resistance by Emil Morhardt. Bookmark the permalink.